It was all very last minute. My thumbs had been twiddling, but there is a plan. Threw things into the car, one outfit if it’s colder, one if it’s warmer and early Saturday I’m off. Breakfast at ABC, farmer’s market, bike ride, a visit with Ariel at her new place. I went from nothing to do to a full fun day. Snap! Better get a move on if I’m going to make 3:00 at Norman Rose tavern. Jessamyn has on her seersucker blazer, Cara an adorable hat. How did I forget that? 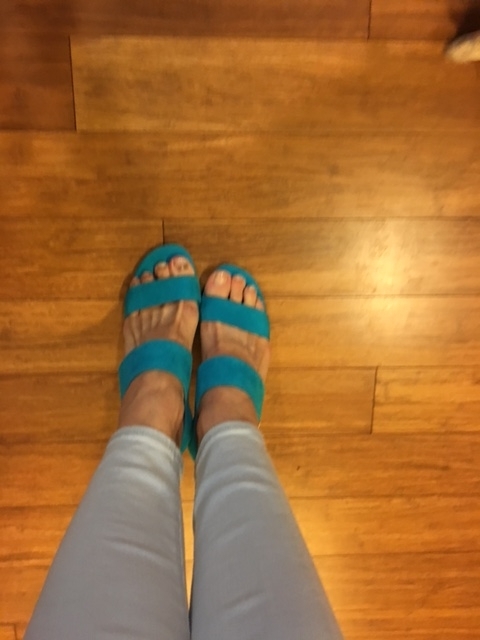 But I was gearing the outfit around the pretty turquoise heels Jessamyn got me for early Mother’s Day. Jessamyn is right, Cara is great and feels nice to be included. The bar is jamming and as things get closer we head over to watch. “Do you want to join the pool?” the woman asks. Jessamyn sits out, Cara and I each give her $10. I look at the list of names. I’ve never done anything like this before. Know absolutely nothing about horses, racing, or the Kentucky Derby. She and I both pick a motto for life: Always Dreaming. Much nicer than “Practical Joke” or “Battle of Midway”. My $10 gives me back $57. So my total out of pocket for drinks, truffle fries, and tempura shrimp: $4. Good thing there wasn’t another race right after, I might’ve doubled down. My Derby shoes, from Jessamyn….pay no attention to the bruise on the toenail! got it while trekking gorillas in Uganda! This entry was posted in current events, entertainment, Family, fashion, Life Experiences and tagged Derby, gambling, Kentucky Derby, napa. Bookmark the permalink.